BEEF LAYER: Saute onions in 2 tablespoons butter. Add ground beef. 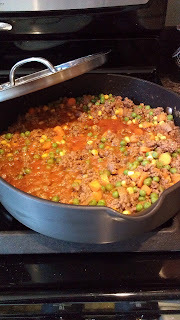 After beef is browned, add tomato sauce; Mix in vegetables. Add salt and pepper, to taste. POTATO LAYER: Peel and slice potatoes 1/4-inch thick. Cook in boiling water for approximately 15 minutes or until fork-tender. Whip potatoes with electric mixer; mix until moderately smooth. Don't over beat them; a few lumps are nice. Add 1/2 cup heated milk, 1/2 cup butter, and sour cream. Salt and pepper, to taste. Whip until mixed. Adjust thickness by adding more milk, if desired. BISCUIT LAYER: Combine biscuit mix and 1 cup milk. The mix should be thinner than normal biscuit mix but not runny. 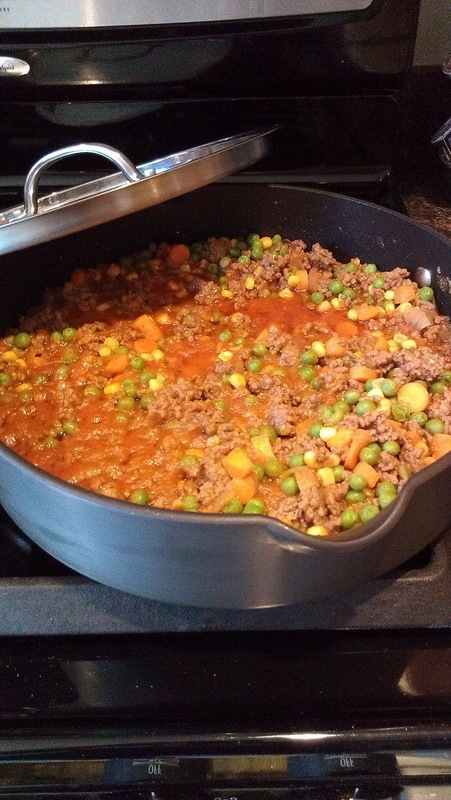 Spray a 9 by 9 by 2-inch pan, or any similar casserole dish. Layer half way up with the mashed potatoes. Next, spread a layer of mixed vegetables or niblet corn on top of potatoes. Then add a layer of the meat. Pour biscuit mix over meat. Melt 4 tablespoons of butter and drizzle over top. Bake for approximately 35 to 45 minutes until top is golden brown. Recipe compliments of Paula Deen, see original recipe here. Last minute desire to make Super Bowl themed cookie cake. Inspiration from Brad back in college days. Lucky for me Mallory showed up drunk with the guts to color in the cookie so it was not too plain. Before drunk friend............................ After drunk friend. Much cuter!